It’s safe to say that a generation of science enthusiasts were inspired by and knowledgeable about the wonders of life on earth (and beyond) by the man best known as Bill Nye “the Science Guy”. 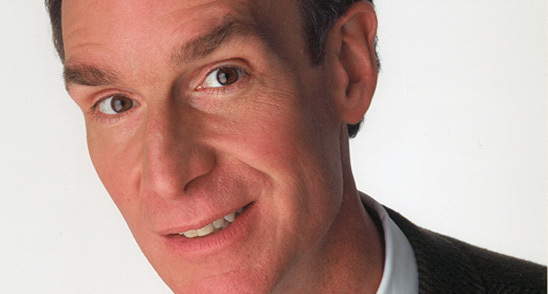 In recent years, William Nye’s concern about our changing planet has garnered him new monikers, like Bill Nye “the Climate Guy”, and as Executive Director of The Plantary Society, Bill Nye “the Planetary Guy”. In this week’s eSkeptic (the first part in a two-part series), we present an article from Skeptic magazine’ (volume 1, number 3) in which Michael Shermer investigates an extraordinary claim regarding proof of ESP made by the Edgar Cayce Association for Research and Enlightenment (A.R.E.). In their study, two classic (but extremely common) blunders were committed: (1) misinterpreting statistical results, and (2) ignoring a basic tenet of scientific testing—repeatability. Tune in next week for the response from the A.R.E. and Michael Shermer’s reply. One of the most overused one-liners in the statistical business is Disraeli’s classification of lies into the three taxa of “lies, damn lies, and statistics.” Unfortunately it is sometimes true, as the recent presidential election will attest. George Bush and Bill Clinton tossed out mind-numbing numbers about the opposition’s failures and their own successes, while Ross Perot waved his voodoo stick over dozens of charts, graphs, and curves. But if statistics are nothing but lies, then what good are they as a scientific tool? The answer is that the tool itself is not deceitful. 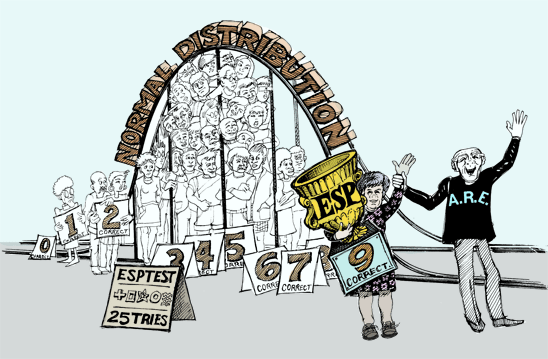 The presentation of some statistics and not others to slant one’s position—a lie of omission not commission—is a common abuse, but this in itself does not negate the process. 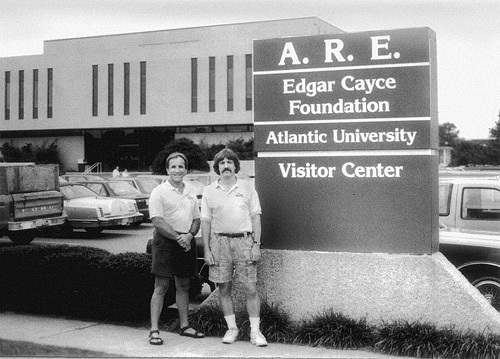 Skeptic editorial advisor Dr. Clay Drees and publisher Dr. Michael Shermer none the worse after a skeptical investigation of A.R.E. A potpourri of lectures and seminars reinforces belief in the believers and provides an opportunity for the uninitiated to get involved. A lecture on “Egypt, Myth, and Legend” by Ahmed Fayed has a not-so-hidden agenda: Edgar Cayce was once an Egyptian living in pharaonic Egypt. “Naming the Name: Choosing Jesus the Christ as Your Living Master,” demonstrates their openness to the more traditional religions and their lack of discrimination between any and all belief systems. A Southern California seminar on “Sounding and Overtone Chanting” will give you “tools for empowerment and transformation.” A three-day seminar on “The Healing Power of Past- Life Memories” features, among others, Raymond Moody, who demonstrates that the near-death experience is a bridge to the other side. The most scientific piece of research equipment at A.R.E. 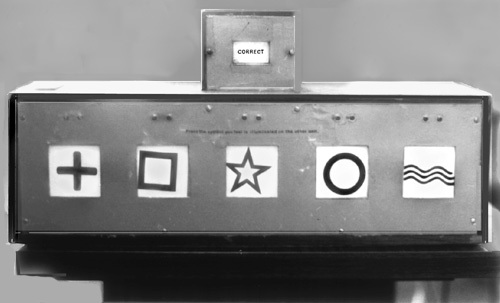 was the ESP testing apparatus, complete with Zener cards, and lights and buttons for both sender and receiver. Click the diagram to download a larger PDF version. Most people (79%) will get between 3 and 7 correct (probability is a more precise calculation). The chances of getting 15 correct is about 1 in 90,000. Guessing 20 out of 25 has a probability of about 1 in 5 billion. I asked the group, “how many people in the first set got below 3?” Three people raised their hands and all said they got 2. The ESP Testing Score Sheet: The Skeptic’s Score Sheet proves that skepticism blocks psychic power (click image to enlarge). Instead of being proof of ESP, as these folks were claiming, these test results suggested that nothing other than chance was operating. Statistics do not lie. The deviation from the mean that this experiment revealed was nothing more than what we would expect under these conditions with these parameters. If the audience were expanded into the millions through a medium like television there would be an even bigger chance for misinterpretation of the high end scores. 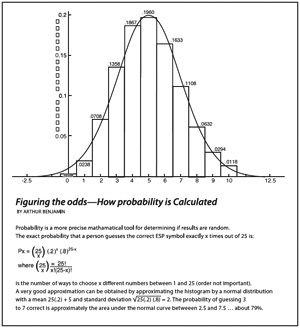 In this scenario a tiny fraction would fall at 3 standard deviations above the mean, or get 11 hits, a still smaller percentage would reach 4 standard deviations, or 13 hits, and so on, all by chance and the randomness of such large numbers. For psychics, the psychology of statistics is that you take the most deviant subject (in this statistical sense) and tout him as the proof of the power. For skeptics, the science of statistics tells us that by chance, and given a large enough group, there should be someone who will score fairly high. There may be lies and damned lies, but statistics can reveal the truth when murky pseudoscience is being espoused to an unsuspecting group. “Bingo!” I exclaimed, thinking I had a convert on my hands. “You got it. It is just selective perception.” But I was too optimistic. “No, this just proves that psychic power works sometimes but not others.” I am afraid I cannot improve upon Randi’s quip about belief in the paranormal being like an “unsinkable rubber duck”. Baker, R.A. and J. Nickell. 1992. Missing Pieces: How to Investigate Ghosts, UFOs, Psychics, & Other Mysteries. Buffalo: Prometheus. Cerminara, G. 1967. Many Mansions: The Edgar Cayce Story on Reincarnation. New York: Signet. Gardner, M. 1952. Fads and Fallacies in the Name of Science. New York: Dover. Randi, J. 1982. Flim Flam! Psychics, ESP, Unicorns and other Delusions Buffalo: Prometheus Books. Palm readers, astrologers and those who claim they can talk to the dead make the rounds of national talkshows. Even police departments enlist the services of “psychic” detectives. But what proof do we have that any of these claims are real? Richard Wiseman and Robbert Morris provide helpful and professional guidelines to help health professionals, law enforcement agencies, cult investigators, scientists, and the public at large assess those who make psychic claims. READ more and order the book. Rowland demonstrates a wide range of seemingly psychic and impossible effects (no magician secrets revealed!) while outlining what he refers to as ‘real’ mind power. A very funny, entertaining, and educational show. Randi’s masterpiece-classic account of dozens of his personal investigations into the paranormal. This is the bible of the skeptical movement. No skeptical bookshelf should be without it. Includes Randi’s hands-on investigations of the Bermuda Triangle, Transcendental Meditation, alternative medicine, ESP and PSI, and how Sir Arthur Conan Doyle got taken by fake fairy photographs (despite Houdini’s debunking of them). Insightful and a page-turner. Randi at his best. READ more and order the book.